Aspirin (acetylsalicylic acid, ASA) is the lead non-steroidal anti-inflammatory drug (NSAID) and is widely used for relieving inflammation and mild to moderate pain and fever (1, 2). In addition to its primary actions, ASA also displays a wide range of beneficial effects including reduction of the incidence of coronary artery thrombosis and myocardial infarction and prevention of sporadic colon cancer (3,4). The anti-inflammatory, analgesic, antipyretic and cardiovascular protective properties are closely related to its ability to inhibit prostaglandin (PG) and thromboxane (TX) biosynthesis by acetylating the cyclooxygenase (COX) enzyme (5). However, not all the beneficial effects associated with ASA consumption can be ascribed to the inhibition of PG and TX biosynthesis, and the precise mechanism of action of ASA is at present still unsettled (6,7). In this regard, recent studies have demonstrated that in addition to block PG and TX production, ASA also triggers the generation of 15R-hydroxyeicosatetraenoic acid (15R-HETE) from arachidonic acid, which by transcellular routes is subsequently transformed to a novel series of eicosanoids identified as 15-epi-lipoxins (8-10). 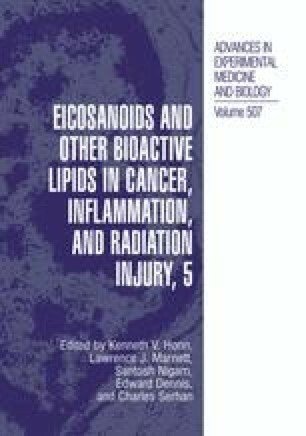 Since the formation of these eicosanoids is specific of ASA treatment, the term ASA-triggered lipoxins, abbreviated as AIL, was originally coined for these compounds (9,10). These novel ATL may effectively account for the beneficial effects of ASA and are indeed able to inhibit cell adhesion and proliferationin vitroand to block local inflammation by reducing both leukocyte adherence and infiltrationin vivo(9-15).